I remember a time when an injury on the field was treated with a sponge and a bucket full of cold water. 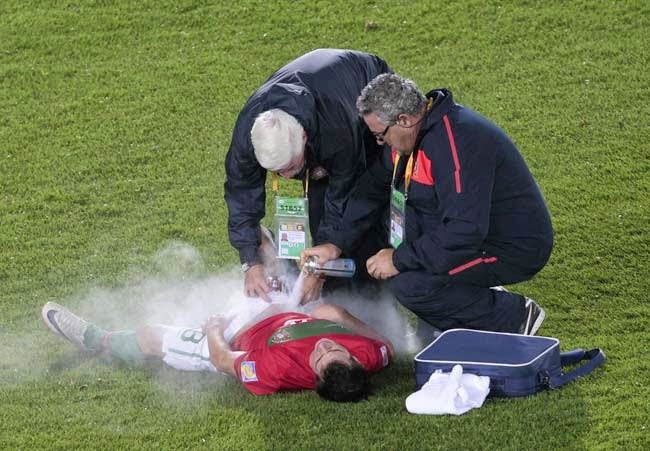 Those times have seen been replaced by the magic spray, but what actually is this magic spray that seems to cure almost any injury on a football field? So I have looked around in search for answers on what is this “magic spray”. 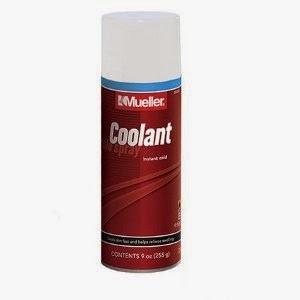 The more I looked the more obvious it was that available to anyone wanting to by one is a product made by Mueller, called Mueller Coolant Spray. Not sure if this is the exact one used in football fields around the world, but everything leads me to believe if it isn’t this one, it is very similar to it. From reading the description of the product it is clearly obvious that there is no medication in it. Nothing more than a spray that has very cold mist inside and it cools off the affected area providing relief. I was somewhat surprised since I was expecting to find some medical ingredients in it, and this was nothing more than a spray can version of the water bucket and a sponge. It is more convenient to walk around with a spray than a bucket full of water and a sponge, that I will have to agree, but to me it almost looks like the guy who came up with this idea was cleaning his keyboard one day, with a bottle of compressed air and sprayed his hand by accident. He realized that it was cold, so in one of those Einstein moments he took the leap of faith and created the “magic spray”. I am not suggestion for anyone to grab a bottle of compressed air and use it on their friends when they go down with an injury, but at your own risk, grab one and spray it. Compressed air is as cold as ice, that thing can even burn your skin if you are not careful, so this magic spray seems to be nothing more nothing less than compressed cold water mist. There is nothing magic about the spray, the issue is not even the spray but the injury. If the player has a serious injury he could spray 10 can of that Ozone depleting crap that he would still be hurt. When Neymar was hurt during the World Cup this past summer, you didn’t see anyone spraying him and bringing him back to life like Jesus did to Lazarus. The injuries when the spray is effective are nothing more than bruises or knocks, nothing broken, nothing sprain, nothing requiring real attention and treatment. If the injury is serious, there is no spray on this planet that can cure that player.